Hayden, a small town in the southwestern part of Blount County, Alabama was first called Rockland, probably so named because of all of the small to medium size rocks that were scattered over the hilly terrain. Rockland became Hayden with the advent of the L & N Railroad in 1914. 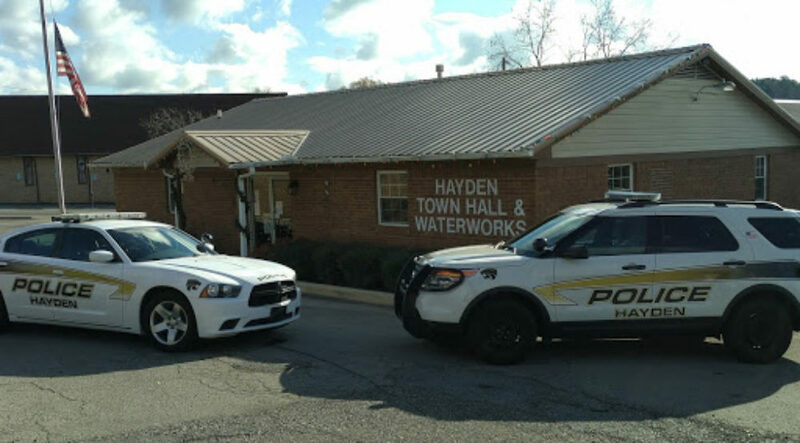 The name Hayden was chosen to honor one of the first settlers, Major Hayden, a former Army officer, who moved into the Blount County area from South Alabama. He died and was buried on a hill near his home on what is known as Hayden Mountain. He had settled there sometime before the War Between the States. The names of the first families settling the area were the Thomas’, Armstrong’s, Neely’s, Hayes’, Yarbrough’s, and Merrill’s. Many of these descendants still live in and around Hayden. Names and dates of these first brave souls who carved a home out of the wilderness can be found on the headstones in the cemeteries thereabout. Mail Delivery in the early days posed quite a problem. The first post office in Hayden was in the home of Ely Merrill. His wife, Elizabeth, acted as postmistress. She kept the mail in a corner cupboard in the large kitchen, which also served as the family sitting room. The mail was brought to the Merrill home by horseback once or twice a week and on those days the women would gather in Merrill’s kitchen or out under a large oak tree to visit, exchange ideas, or just gossip while waiting to pick up the mail. The post office served as a gathering place for the women and girls in much the same way the grist did for the men and boys. For several years school “kept” only during the summer and the schoolhouse was a rude log hut with a dirt floor. They began to have school during the winter months while the children were not needed in the fields. Since heat was needed in the school building a chimney with a wide fireplace was added to a log cabin whose cracks were chinked with mud. If they had windows light was let in through oiled paper over the window openings, As time went on people began to grow more schools conscious a two-room building was erected near the railroad underpass of today. It had one room downstairs and one room upstairs. This building served until just after World War I when the people realized that a larger school was needed so a much better four-room building was built further back from the railroad. Soon extra rooms had to be added and finally in the early 1920’s a larger school site was purchased on the other of the railroad and a large modern school plant was established. It was a modern twelve grade school. As in all pioneer settlements the early settlers soon built a church. The first one was Old Elbethel, a Methodist Church established sometime prior to 1828. Later a new site was chosen, and although there have been several buildings the Hayden Methodist Church is still in service today. Shortly after the Methodist, came the Primitive Baptist. They established Old Providence on the road leading to Dean’s Ferry. Later that church was moved to its present site near the old T. G. Merrill home – almost on the same site. About 1915 the Missionary Baptist established a church at Hayden and until they got their church building ready they held services in the schoolhouse. Their first building stood on a hill above the railroad but later they chose the present site and now have a modern rock building. A few years ago a Church of God church building was erected near the Hayden Cemetery There is also Gethsemane a new Baptist Church standing on a nearby hill.